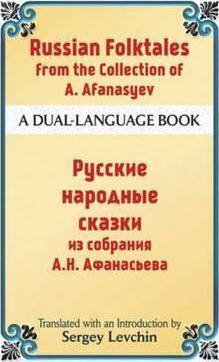 This original dual-language edition features new translations of stories selected from the authoritative three-volume collection by famed author Alexander Afanasyev, Popular Russian Tales. Afanasyev recorded hundreds of folktales, the first compilations of which were published between 1855 and 1867 and featured such characteristically Russian figures as Vasilisa, Baba Yaga, Ivan Tsarevich, and the glorious Firebird. This edition's fables include The Little Hen; The Cockerel and the Hand-Mill; Baba Yaga; The Little White Duck; and Ivanko Medvedko. Suitable for high school and college intermediate-level Russian classes, these timeless tales will captivate readers of all ages. Left-hand pages feature the original Russian text; right-hand pages contain the new English translation by Sergey Levchin, who provides an informative Introduction. Russian folklorist Alexander Nikolayevich Afanasyev (1826-71) recorded and published more than 600 folk and fairy tales. His first collection was published in eight volumes from 1855 to 1867.Kiev-born Sergey Levchin emigrated to the United States at the age of 12. He received his BA from St. John's College and an MA in Russian literature and linguistics from Columbia University. He is also the author of Dover's Easy Russian Phrase Book.